Winter hits me hard. The days are short, the darkness is long, the cold keeps me in and fresh fruit and veggies are a distant memory. That’s when I dream of days like today and yesterday and this past Saturday. Let’s go back to Saturday, shall we? 6:14am I arise. Check on my son. Hmm… he’s already up. I venture downstairs with two dogs in tow to find him on the couch watching TV. Normally I have to ask him to shut-off the TV. Not today. Before I even had my cup out of the cupboard to heat up some day-old coffee he wanted to strike up a game of Uno. I had barely comprehended everything that happened since I left my bed. My gears really don’t start clicking until I’ve had at least a couple sips (okay, a cup) of coffee, which means I was in no condition to play Uno. Of course, come to think of it, maybe he knew that and that’s why he asked me to play right away. Anyway, after I finagled my way out of the game (which, when I’m awake, is a game I love), I was proposed with the next question: “Can we go to Caribou? You said we could go to Caribou before we go to the Market.” I smiled. My insides smiled. Everything about me smiled. He had the bug. It’s definitely genetic. Okay, he’s obviously too young to drink coffee, but he digs a good piece of coffee cake and juice. And me? Yeah, I was ready for some fresh hot coffee and a raspberry white chocolate scone to boot. After all, there were merely hours left until I start my next challenge, I’d better make them worth it! 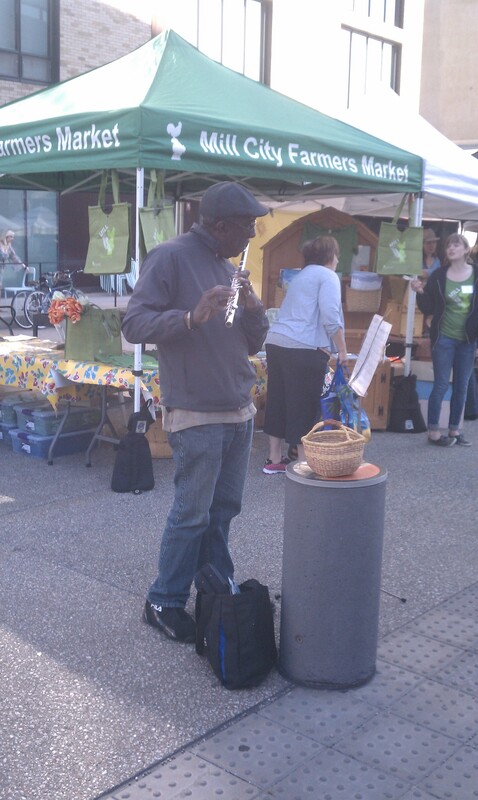 But what really made me smile is that he remembered the Market and wanted to go! I LOVE this child! “Okay, it’s a deal.” I told him. But before we did anything I needed to figure out which market we were going to. You see, last year I’d planned to hit as many Farmers Markets as I could. I think I made it to three. Not that I went three times, but only made it to three locations. This year I want to hit all of them. It might be a stretch, but I’ll see what I can do. So after texting my friend (way too early in the morning) who just happens to write Woo-hoo Tofu!, a wonderful, down to earth food blog, we strategically coordinated a plan and I called my mom. I gave her strict instructions. “Get up, get ready as fast as possible and get to our house.” My friend, two of her boys, her mom, my mom, my son and I were all hitting the market. It was like the movies… the intense sound track, the beat thumping, my heart beat quickened and I could practically hear my mom’s do the same. She accepted the mission. Okay, I’d delivered the message. Time for a quick shower and then to Caribou with my buddy (my son). The morning was perfect. The sun was shining, the breeze was cool but the sun was warm. My son and I headed for our coffee run chatting the entire way. His excitement and my excitement fed off of each other. Again, we talked all the way home. Once we arrived, we enjoyed our Saturday morning treats on the front steps. Mere moments after finishing, the rest of the key players on the mission arrived. Mill City. All I can say is, “Oh, my goodness. What’s not to love?”. With about 70 vendors it’s just about perfect. Not too big, not too small. They have lots of organic veggie vendors, live music, food trucks, just enough local artisans and of course the view. It sits right on the bank of the Mississippi River, in the heart of the old flour mill district in downtown Minneapolis. A Market that makes people and pets happy! Mill City is a Saturday Market. Excellent location. Excellent across the board. Whoever runs this one definitely “gets it”. Okay, you can’t go to the Market and not talk about food, so here’s what I got: a boat-load of sugar snap peas (which my son and I ate half of for lunch), a fun sprout mix including sunflower sprouts and others which I’ve already forgotten (which I’ll use for stir fry and sandwiches), arugula for my cousin’s Bleu Rocket Pizza recipe and kale (just because I love it). While there I spoke with a wonderful woman from Mhonpaj’s Organic Garden who told me to use lemon grass and a mystery plant (she didn’t know the English name) in homemade chicken soup for health because it cleanses the blood, and for compresses on sprains and other injuries. Since I have a son who loves sports I couldn’t leave without buying one of each for the garden! 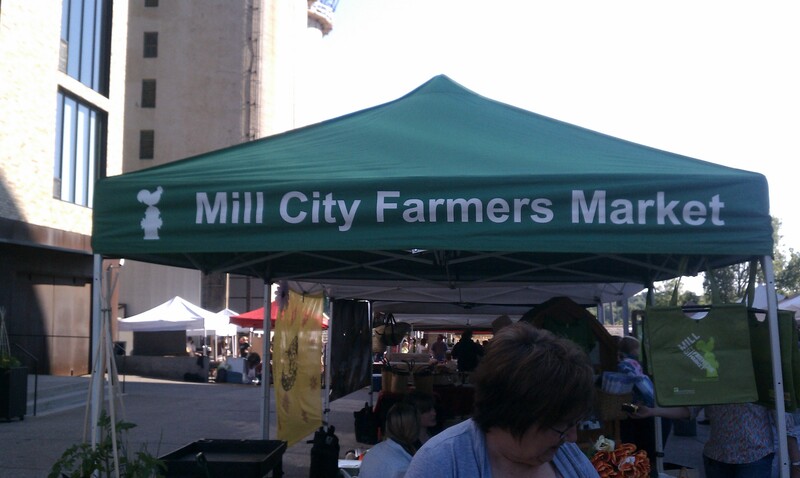 I know its early in the Farmers Market tour, but I give Mill City Farmers Market a double thumbs up! The only downside for me was trying to figure out how on earth to plug the new parking meters. I will definitely be coming back here! My friend and author of Woo-hoo Tofu! and I will be sharing many of the Market adventures together this summer so you can get feedback and input on our “Market Perspective”. Follow us both to keep tabs on the markets and join in the fun! Have a favorite “can’t miss” market? Let us know! 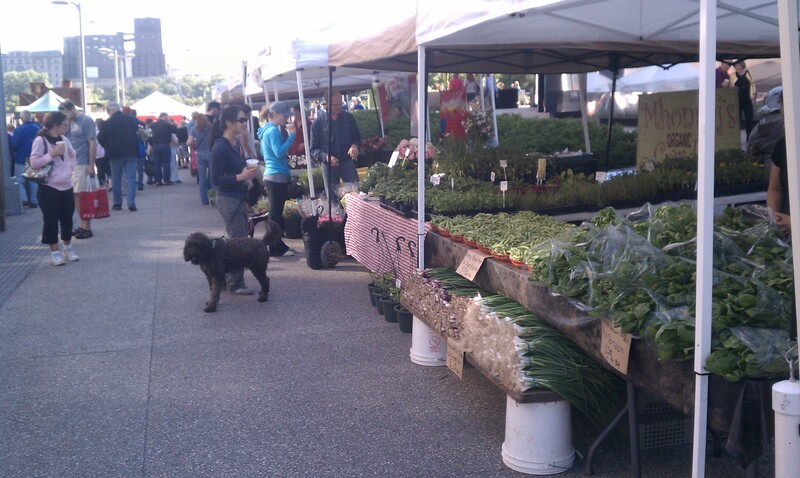 Tags: farmers market review, Mill City Farmers Market, Woo-hoo Tofu!